Swimmers in County Durham can enjoy easy access to tailored timetable information, all the latest pool news and be in with a chance to win a great prize by using a new app. The thrive active swimming app, which launched on Monday 12 November, allows Durham County Council pool users to tailor timetable information to their favourite centre and activity, book aqua classes, view special offers and much more, all at the touch of a button. • Access all Durham County Council swimming pool timetables, details of facilities and class descriptions. • Keep up to date with the latest swimming news and special offers. • Book an aqua class or join the Learn to Swim waiting list. Swimmers will also have the option to receive notifications about any service disruptions. 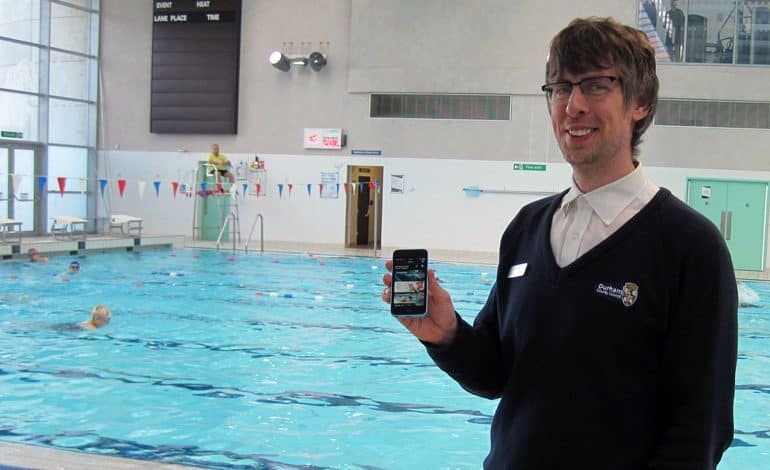 To celebrate the launch of the app, the council is running a competition offering a chance to win either a family pool party at Spennymoor Leisure Centre or a year’s swim membership for one at any of its swimming pools. More information about the competition, including details of how to enter, is available on the app’s news feed. Kaye Stephenson, principal aquatics manager, said: “Swimming is the easiest way to enjoy a low impact, full body workout and the new app makes it really simple to find details of sessions at all our leisure centres. “What’s great is that people can use the app to suit them, so not only can they get information on the go, at any time of the day or night, but they can also choose what they see and how. The thrive active app can be downloaded free from the Apple App Store or Google Play. Visit www.durham.gov.uk/thriveactive to find out more.